Consistency: I do the same thing each week. I wash at the beginning of the week, cowash in the middle of the week, and I moisturize and seal almost daily. I do this day in, month out, and all year round. Consistency helps to ward off breakage and dry hair, and it also means that I will be style ready at all points of the week. It is the key for growing long hair, as well as making natural hair easy. I'm Unique: I used to try to use other naturals' regimens as my own. I would eat up my favorite bloggers and vloggers regimens, only to find it didn't work for my hair or wasn't working within my time commitments. Instead, I had to develop my own regimen. 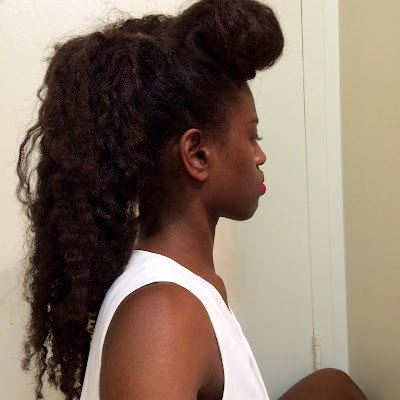 Because my hair is unique only to me, I had to create my own regimen, my own techniques, and my how-to's for hair styles so that everything fit perfectly for me. Patience is Golden: I big chopped in 2009, I wasn't waist length by 2010. In fact, it took til 2013 for me to reach waist length hair. I can't say that I embodied patience at all times, but I knew that I could do nothing other than be patient. Miracle Products Don't Exist: Miracle products promise an ideal outcome with little effort. They're always too good to be true. From tea rinses to scalp massages to protective styles, I used to try everything to grow my hair quickly until I realized that they weren't working...and some were even causing damage. Instead of trying to find a miracle product, I began to focus on products that properly moisturized my hair and products that made my hair strong. 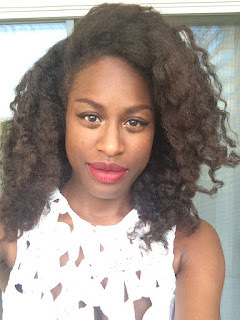 I began to incorporate techniques to prevent breakage. When I focused on the health of my hair, my hair began to flourish. Health Over Aesthetics: I continue to struggle with today. But I always have to remind myself to focus on the health of my hair. When my hair starts to get dry in the middle of the week, I can't continue with my hairstyle, I need to cowash and start over. If I love my stretched style, but my ends are getting ragged, I have to wash. And in the summer when humidity is at an all time high, I need to stick to protect styles. Making a hairstyle last isn't worth the damage it causes. Hi, at the beginning were you protective styling with extensions or you just did mini twists with your own hair? Hey Tracey! I actually didn't start any kind of protective styling to close to a year after I big chopped. Up until that point and when I figured out how to make hairstyles work for me, I just wore my hair in an curly afro. Hello. Im trying to leave a comment on here, but its not showing up. Please let me know if you receive this. I have a question regarding moisturizing and sealing. Thank! Thank you for responding. My question has to do with daily moisturizing and sealing. I've been wearing my hair natural for two years this August, and throughout this time I've heard/read 'moisturize and seal' countless times. My question is, what does that mean? I've been wearing my hair curly - set on rollers, so how would I moisturizer and seal daily with this style while maintaining the look? Which products would I use? Also, do you think rod sets are a good protective style? Btw, I am a fellow Washingtonian, born and raised. I get some of my Giovanni products from the Whole Foods on P. St NW. Moisturizing and sealing is a technique used to keep hair moisturized. You would apply the moisturizer – like Giovanni direct leave in – to your hair and make sure you massage it in to ensure each strand is moisturized. Then directly after, you would apply an oil (like olive oil) or a butter (like shea butter) to hair and this helps to seal the moisture into hair. In regards to wearing your hair curled, you could moisturize and seal each night, and you would reset hair during this time (you would use less rollers, only use enough moisturizer to lighten dampen hair, and let air dry at night and take the rollers out in the morning). If you don’t want to do it daily, you could do it every other or every third day.